This Bauhaus Icon is available through nova68.com. Designed by Mies van Der Rohe for the Bauhaus in 1927! 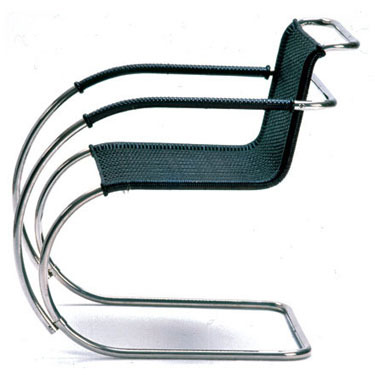 The wicker-work for the chair was created by Lilly Reich, assistant to Mies Van Der Rohe. One of the better, if not best Icons of Modern Design! This is the authentic and fully authorized edition by Tecta. This chair is one of the classics in the history of furniture. The D 42 armchair fits well in the domestic setting but can also be used in waiting areas or corporate environments. Bauhaus became a dominant force in architecture and the applied arts in the 20th century. The main theory was that all design should be functional as well as aesthetically-pleasing. Ludwig Mies van der Rohe (born Maria Ludwig Michael Mies) (March 27, 1886 – August 19, 1969) was the leading architect of the modernist style. Born in Aachen, Germany in 1886 as Ludwig Mies, he worked in his father's stone-carving shop before he moved to Berlin and joined the office of Bruno Paul. He worked at the design studio of Peter Behrens from 1908 to 1912, where he was exposed to the current design theories and to progressive German culture. A physically imposing, deliberative, and reticent man, the talented Ludwig Mies renamed himself as part of his rapid transformation from a tradesman's son to an architect working with Berlin's cultural elite, adding the more aristocratic surname "van der Rohe". He began his independent professional career designing upper class homes in traditional Germanic domestic styles. He admired the broad proportions and cubic volumes of early nineteenth century Prussian Neo-Classical architect Karl Friedrich Schinkel, while dismissing the eclectic and cluttered classical of the turn of the century . But after World War I, Mies began to turn away from traditional styles, and joined his avant-garde peers in the search for a new style for a new era. The traditional styles were long under attack by progressive theorists since the mid-nineteenth century, primarily for attaching ornament unrelated to a modern structure's underlying construction. Their criticism gained substantial cultural credibility after the disaster of WW I, widely seen as a failure of the imperial leadership of Europe. The classical revival styles were reviled by many as the architecture of the now-discredited aristocratic system. Boldly abandoning ornament altogether, Mies made a dramatic splash with his stunning proposal for an all-glass skyscraper in 1921, and continued with a series of brilliant pioneering projects, culminating in the temporary German Pavilion for the Barcelona exposition in 1929 (a reproduction is now built on the original site) and the elegant Villa Tugendhat in Brno, Czech Republic, completed in 1930. Mies worked with the radical magazine G which started in July 1923. He developed prominence as architectural director of the Werkbund, organizing the influential Weissenhof prototype housing project. He was influenced by the aesthetic credos of both Russian Constructivism and the Dutch De Stijl group, and was impressed by the Prairie Style work of Frank Lloyd Wright. He joined the faculty of the Bauhaus school, teaching architecture. He designed modernist furniture pieces that have become popular classics, such as the Barcelona chair and table, and the Brno chair. Mies adopted an ambitious lifelong mission to create not only a new style, but also a new architecture that would represent a new epoch just as Gothic architecture did for the middle ages. But the world-wide economic depression and the rise of the Nazis interrupted his quest. In the 1930s Mies served briefly as the last Director of the faltering Bauhaus, at the request of his friend and competitor Walter Gropius. Nazi political pressure forced Mies to close the school, a victim of its previous association with socialism, communism, and other progressive ideologies. He built very little in that decade (his major built commission was Philip Johnson's New York apartment), his style rejected by the Nazis as not "German" in character. He left his homeland reluctantly in 1937 as he saw his opportunity for future building commissions vanish, accepting a residential commission in Wyoming and then an offer to head an architectural school in Chicago. When he arrived in the United States after 30 years of practice in Germany, his reputation as a pioneer of modern architecture was already established by American promoters of the international style.